The Lavry AD11 makes the perfect front end for a portable rig. It even works with Protools 9 and can record a D.I. signal and a vocal at the same time. "The AD11 stereo A to D converter offers USB connectivity, ideal for portable recording systems. Other features include built-in microphone preamplifiers with phantom power, large wide-range LED meters, and Lavry’s exclusive Digital Tape Saturation Emulation (“Soft Saturation”). All settings are controllable from the AD11’s front panel using a system similar to that of the companion D to A converter- the DA11. Building on Lavry’s long established reputation of making the most accurate AD converters available, the AD11’s no-compromise design offers substantial value at an affordable price. With converter and microphone preamplifier performance that exceeds other manufacturer’s stand-alone units, the AD11 combines musicality with functionality. The USB output is available in parallel with both XLR and RCA AES/SPDIF digital audio outputs, so more than one recording or monitoring device can be fed directly from the AD converter. The MicPre function and phantom power are selectable on each channel, as well as the Soft Saturation and +4/-10 level functions. Like the previous LavryBlack model AD10, the AD11 has “XLR-TRS combo jacks” for the analog inputs. When a balanced or unbalanced ¼” plug is inserted, 12 dB’s of fixed gain is automatically added to the front panel adjustable gain, to boost “-10” consumer level signals to “+4” professional level. 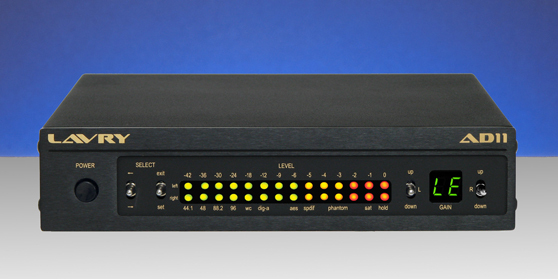 Front panel line level input gain adjustment is available for each channel in 12 precise one dB steps. Additional gain in the range of 20 to 65 dB’s is provided for balanced low-impedance sources (typically microphone). This makes it possible to record the “direct” signal from a guitar effects unit or keyboard at the same time as a vocal mic, with no more than the AD11 and a laptop! In addition to “dual monaural” recording; extremely precise matching between channels makes the AD11 equally well suited to high quality stereo Mastering applications or “true” stereo recording. Whether it’s home, on location, or professional studio- the AD11 is the right tool for the job!" 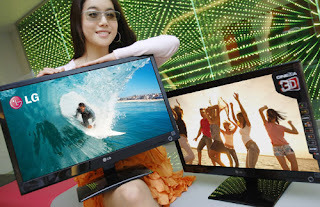 LG Electronics (LG) announced the release of two CINEMA 3D Monitors –D41P and D42P – equipped with LG’s new Film Patterned Retarder(FPR) 3D technology. With FPR 3D technology, the monitors offer a brighter display, clearer images, and a “Flicker-Free” certified 3D picture that makes 3D viewing more comfortable. "Tweetdeck has release a new version 2.0 of its app for the iPhone. They are calling it a ‘Hollywood-esque “re-imagining” where the essence of the original remains but it’s brought up to date. It’s taken “several months of feverish work”. Improved features include swiping between columns, navigation through user profiles and the ability to add columns as well as ‘Pull to Update’ and Follow/Unfollow sliders tweaks." You can download the iPhone TweetDeck v2 from the AppStore here. 500 series gear seems to be the rage nowadays and Purple Audio has some interesting modules. One of which is the Biz MK; A unique sounding, three amplifier, discrete 500 series microphone preamp module. "The smooth Gain control helps you dial in the sound you want. If the output level is too high (the Class A/B output opamp can pump out up to +27 dBu), you can ride the level down with the separate Level control. Pressing the "Dual" switch splits the gain between two of our Class A opamps, enabling up to 75 dBu of clean gain, making the Biz a perfect match for ribbon microphones. With different Gain, Level, and Dual settings the Biz can produce an infinite variety of tonal variations with the same amount of output level. The front panel DI helps you record instruments and line level sources with unrivaled clarity and punch. Two LEDs clearly indicate signal level for the gain and output stages at a glance, turning green to indicate signal present, yellow for 10dB below clipping, and red for clipping."